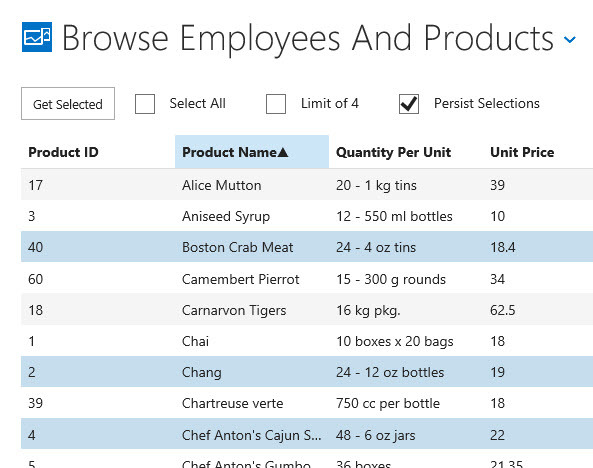 LightSwitch 2013 HTML Client – Easily add Multi Item Selection to your Lists and Tables! 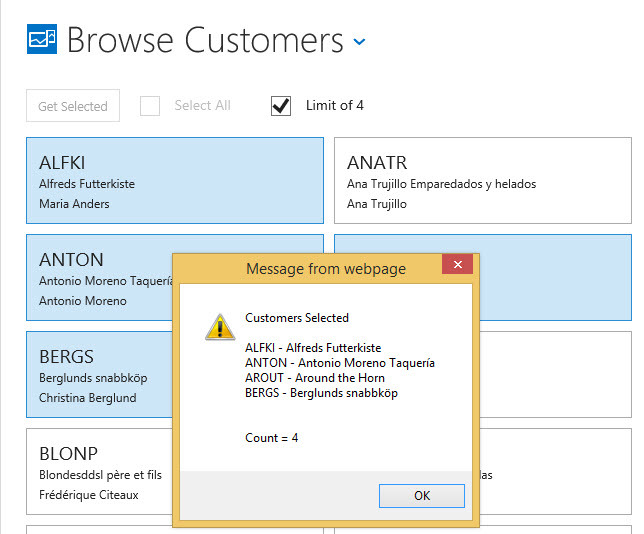 Enhancing your LightSwitch List, Tiles and Table controls – Updated! We have refactored from the earlier build… so please review the new steps! As of May 2014, Out of the Box LightSwitch list, tiles and table controls only allow for selection of a single item. So… we’re like squirrels here, constantly distracted. And so with that said, we’ve nailed down our long term name for the library. Going forward we’ll be branding as LightSwitch Wires, or lsWires for short. Since in reality that’s kind of what we all do. We add the wiring to LightSwitch to make things work or work better. And this naming convention works for our other disciplines like Kendo UI and Syncfusion. We’ll keep the “Wires” branding and just swap out the prefix for the type of wires we’re providing. Thanks for your patience, this is the LAST breaking change. Before you can run, remove the default ItemTap that LightSwitch automatically adds for the list. We did not create the view screen that the ItemTap is expecting so you’ll get an error when selecting if you don’t. Hmmmm… how do I get the data of the selected items? // Else is the current count greater than our limit? So what happens if this was a list vs a Tile List? As you see, same code, different control type, same results! Now you ask… table too? Same code, works as expected on all 3 controls! So there you go… an easy, reproduceable method of enabling multi-select on your LightSwitch list controls. You can even have multiple lists on the same screen, each will behave independently. We'll leave that up to you to go play around and test. Our sample project already has a multi-list screen if you want to go check it out. We’ve added functionality to persist selections for a session. Its also a key part for a table control if you are going to allow your clients to change the sort order by clicking on the columns. You’ll set the control to persistSelections and it won’t be a problem. Check out the sample project for the code, its quite simple. Also check out the live preview on how it works. Obviously if you are using an ItemTap to get to an edit/view screen, you would not implement this, but you could, since we no longer take that over and we do allow for persistent selections. But for most, selection and batch processing, this is the ticket. One final note regarding the Select All functionality. We are selecting and working with rendered items. So with virtual scrolling, not all items from a query have been returned and rendered. Which means if you do a Select All, scroll and more data comes down, the new data is not selected. Of course one could go and press the Select All button again, or you could do a dataBind and fire off another Select All. But I don't see many instances of where that is appropriate. But you could. Works perfectly. Thanks for this, it took me a while to find something this helpful. I’m new at using Lightswitch so I will really appreciate your help if you could please tell me how I can insert the same data for each selected item? Great work thanks. Working well except selection is not kept when the column header is clicked to sort? In my application i used the enableListToBeMultiSelect of the new lsWire.js file and it’s working fine in desktop browsers but i try’d it on an android phone and it’s dose not work. Do you know why and how i can solve this? I am trying to take a source collection and “select” the ones in the target collection (my lswires list) but am having a problem accessing the “selected” property of the lswires list? In other words, I have a list of chosen items that I want to have pre-selected in the lswires collection by iterating through the chosen items collection and having them “selected” in the lswires list collection? everything works down to the “lsWire.list.item.selected = true;” statement which does not “select” the item? Is there a way to “unselect” all list items? but getting exception that totalAllowedSelections is undefined? There is a bug in the enableListToBeMultiSelect function… the latest js file can be downloaded here… http://lightswitch.codewriting.tips/uploads/lswires.zip This should take care of your problem. if I want to implement the itemTap how should I do that? I’m not clear on what you mean… I’ll post later today how I use multi-item selection in a pick list. Sorry its been confusing. I see.. yep that’s one of the downsides of a multi selection list. Work around is to put a link or button in each list item that will go to its particular details. Easily done also. do you know any alternative to open a screen with a specific entity to edit ? Ya that will cause issues due to the static screen ID. That ID is used for tracking internally by the LS navigation stack. Best practice is to create a screen parameter and pass the entity. do you know how can i do that ? Check out the tutorial I just posted. We show how to pass an entity in there. If that is still confusing, I’ll put something together for you. I am a bit confused by this. In this same page you say “•We no longer take over the ItemTap”. Hi thanks for this post it’s grate. just one thing if I want to implement the itemS how should I do that? I am using a table grid. When I add a button in each row to call a dialog window: The multi-select is blocking the button click event. If I comment out the multi-select line “lsWire.list.enableMultiSelect(contentItem);” the event of the button works well. Any ideas on how to solve tis problem. Thanks in advance. Hi Dale, awesome as usual! I’m trying to incorporate some of the stuff mentioned in the post above into a screen designed with your also excellent ‘Enhanced Grid’ template; for example, enabling multiselect, which appears not to be incorporated in that project. Is it even possible to ‘mix-up’ the two projects’ features? I had the same issue. I tracked it down to the fact that I had more than one screen instance of a collection (e.g. my collection is “Options” and my screen controls were “Options” and “Options1”)(by default, LS adds a “1” to the next instance of the control. I determined that the screen control “Name” must match the collection and it works. It would not work on the second “Options1” control at all. I always got the same error. The error “sort of” gives an indication like that since it’s looking for “contentItem.name”. I’m not understanding your comments, I’ll email directly to see what the issues are. Awsome post, Is it possible to put the select All button on command bar ??? Absolutely, its just a function call, so create a new button, write your own method and then call the selectAll method. I’ve not worked with the WCF RIA sources so I’m not much help in that area. If I get a chance I’ll give it a shot. my apologies. Thanks Isaac… Took a while to get that tilting working with LightSwitch, but the possibilities are cool when it comes to help or menus. I’ll try to put up a post on how to accomplish this if there is interest. But there is one issue I’m stuck with maybe some of you have seen it before. $.cache[item[$.expando]] – element is always undefined !!! but the “selected” variable contains the list of td elements that I have selected on the table. Can you please advice, what I’m doing wrong. I’ll email you directly to help work the issue out. What was the advice, on this one? I can’t get the multi-select to work at all. i really liked your post but have some awkward kind of issue at my end, when i publish the light switch application in release mode the alert scripts and script below it seems to not work. Any suggestion on what am i doing wrong. The reference is null or undefined. By the way, I cannot find lo-dasg.js, only lodash.js. The same? Hmmm… I don’t see in the posting lo-dasg.js… I’m checking again the instructions. Did you download the sample project and get that to run successfully? The selectAll works though, but not when I click on one line. Now it all works. Know why? I forgot. Great work with this one, It’s super nice. I will have to leave this for now. Maby the complexity of my project messes things up. One thing I left out… which I’ll add into the instructions is this… LightSwitch adds a default ItemTap for the list, but we never added the screen. So delete the ItemTap in properties. in the “Browse Employees and Products” view on the live test drive site, the Product list view works fine. But, if you change the sort by selecting a column header, the multi-select no longer works. Interesting… I will investigate and see what I can fix. Thanks for the catch! This has been fixed, live preview has been updated and along with gitHub repositories. Thanks for finding this bug! Article very didactic, easy to implement and very powerful! Very creative Dale. Thanks a lot. Great work but FYI, using your ‘MultiSelect Preview’, there appears to be a bug. Using Desktop IE11, First entry ‘Select All’ doesn’t select the last customer but if you ‘Unselect All’ then ‘Select All’ it works OK. Worse on Android (Nexus 7) because as you scroll down the bottom block of customers do not show as selected i.e. are not pale Blue. Unselecting all then selecting all again does not seem to fix the problem. I haven’t had time to read the details of your blog yet so if there’s some reason you don’t select all when the button is pressed then it’s not a bug but a feature (as we say). Anyway, as a users, it wasn’t what I expected. BTW My quick test showed that ‘Limit’ code seemed to work well. Hey thanks for the comments. LightSwitch works based on virtual scrolling. The selectAll will only select what has been loaded into the DOM at the time selectAll is pressed. LightSwitch by default loads 45 at a time. Once you start scrolling down it keeps loading more. Which means you will see unselected items if its a large list. Which in reality you probably wouldnt be selectingAll. I talk about this at the bottom of the Blog post. Perhaps I’ll force the loading of all the items in the preview. Yeah I thought you might have a reason and I could see that it was not selecting beyond the data refresh and that’s kind of random maybe based on whether the customer tiles display 1-up, 2-up, 2-up etc. i.e. the form- factor or the browser and the amount of scrolling involved. Because it was inconsistent depending on the two browser / form-factors I chose I would prefer that it actually did select ALL customers. I might want to assume that, without scrolling, that everything had been chosen regardless of the technical vagaries of the development tools defaults. i.e. ‘Dumb User’ POV. So to that extent I would support a full load as the default in this case or a more complicated page by page selection option i.e. only what I can see is selected when I say ‘Select All’ IOW ‘Select All Visible Customers’. Not sure to what extent loading all customers would slow down the load though. You certainly wouldn’t try that with a million customers in the DB. I can see a use for this in user config e.g. which States are you following, the users selects them and you save the data to a config to default for next time. Plenty of other uses too. I very much appreciate you work. Cheers. Working as I would expect now. Consistent on Droid, IE11 DT & iOS. Impressively instant selection on my iPhone4 BTW. I look forward to getting the time to dive into your blog and figure out what you’ve done to achieve this result.